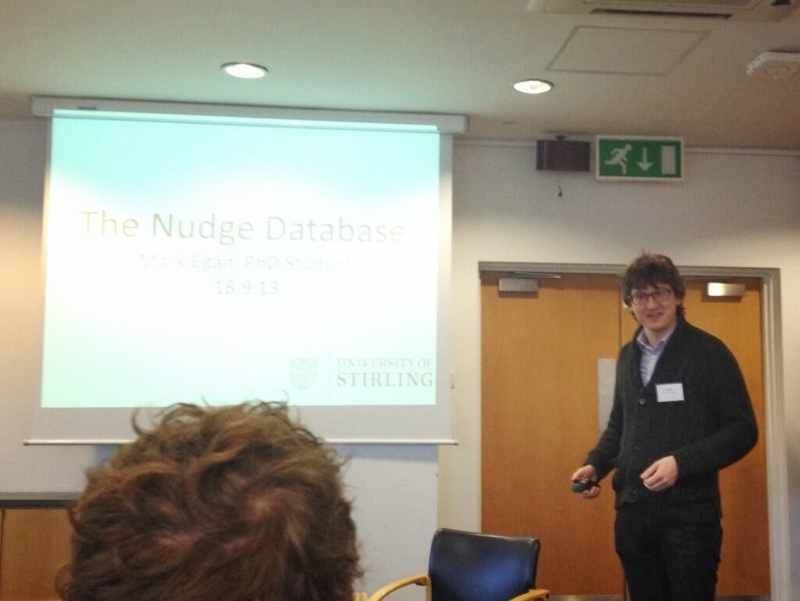 Thanks to all of those who attended on workshop on behavioural economics and public policy in Stirling on Friday November 8th. Some notes and suggested readings are below (thanks to Leonhard Lades for notes and Aisling Ni Chonaire for photographs). Details of future workshops will be provided to the mailing list and through this blog and our twitter page. Liam Delaney spoke about the relation between childhood self-discipline and unemployment, combining research in the areas of unemployment, well-being, and inter-temporal choice. 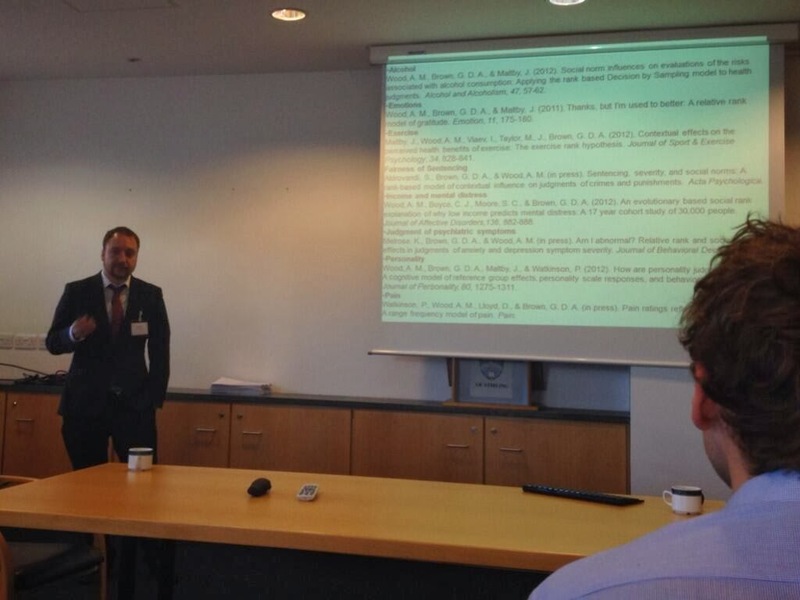 He highlighted that most childhood interventions do not lead to lasting improvements. The research he presented suggests reasons for this failure. He showed, for example, that the timing of one’s graduation is an important factor determining future psychological and economic outcomes. If individuals graduate into good times, their levels of self-discipline do not have a strong effect on their status of unemployment several years later. However, when individuals graduate into bad times, low levels of childhood self-discipline strongly predict unemployment in later years. Hence, interventions should be tailored to individuals depending on their level of self-discipline. Alex Wood highlighted that many behavioural interventions utilizing social comparisons have failed. The reason for this failure, he argued, is that interventions are only effective if the information about social comparisons is presented in the same way that individuals perceive the information. Many interventions have encouraged individuals to compare themselves with the average individual, for example, in their neighborhood. People, however, do not compare themselves to the mean. Much more important is the individual rank (e.g. whether individuals are in the Top 10), which Alex Wood explained by the evolutionary survival advantage of a high rank. 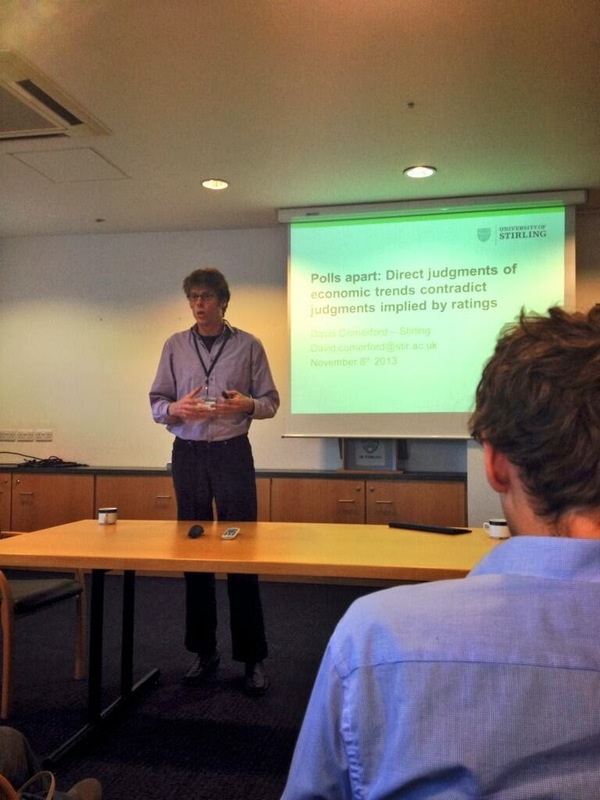 He presented a multitude of behavioural interventions in various domains that encouraged rank-based comparisons and (therefore) successfully changed individual behaviour. 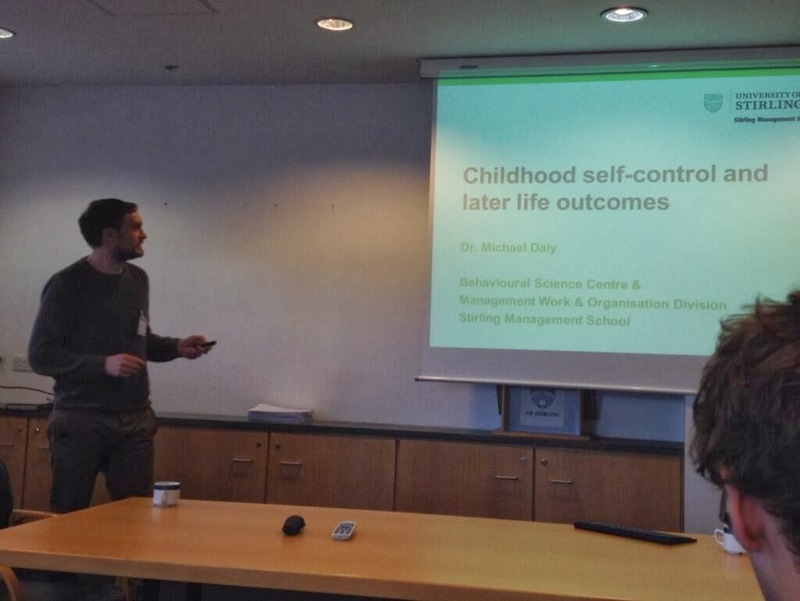 Michael Daly presented research highlighting the importance of self-control in early childhood for explaining health outcomes and economic outcomes. Showing that the gap in self-control opens already early in childhood, he stressed the importance of intervening very early in individuals’ lives in order to reduce negative outcomes due to low levels of self-control. Drawing on work by Nobel laureate James Heckman (e.g. the Heckman Equation: Invest + Develop + Sustain = Gain), he stressed the importance of distinguishing between inputs and outputs when developing behavioural interventions in early childhood. Stressing that most research has focused on cognitive capabilities and skills which are very difficult to change, he suggested focusing more on non-cognitive aspects of key capabilities such as self-control in order to improve individual decision-making already early in individuals’ lives. This focus on early childhood interventions, he argued, is indicative of a shift in focus from crisis management to prevention. 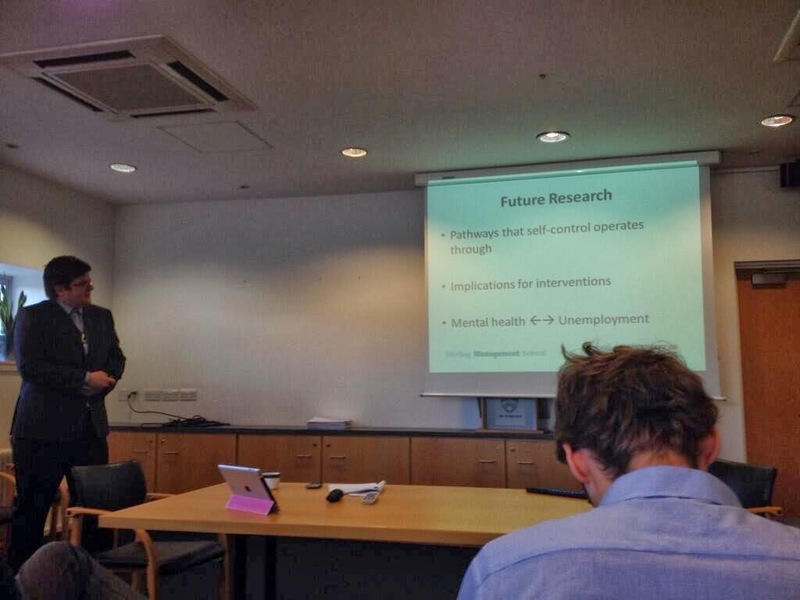 David Comerford’s presented findings from a set of studies he has been working on with colleagues addressing how people perceive changes in economic conditions. A number of applications are currently being developed including as part of a Scottish Government project to measure consumer sentiment. Mark Egan gave a summary of a database of over 100 studies he has been building and continues to make additions to on the theme of behavioural intervention. - A list of behavioural policy readings is provided on this link that address a number of the ethical and policy questions discussed during the panel session. - Behavioural Foundations of Public Policy edited by Shafir is a particularly powerful introduction to behavioural science applications to policy questions. - Daly, M., & Delaney, L. (in press). The scarring effect of unemployment throughout adulthood on psychological distress at age 50: Estimates controlling for early adulthood distress and childhood psychological factors. Social Science and Medicine. - Mark mentioned two papers in response to questions; (i) regarding the increasing personalization of interventions, Cass Sunstein has an essay on Personalized Default Rules and (ii) regarding interventions that can improve childhood self-control see this Diamond & Lee paper "Interventions Shown to Aid Executive Function Development in Children 4 to 12 Years Old"
- Publications page for Alex Wood.